I really love fairy tale adaptations. I tend to agree with Debora Geary who said, "Fairy tales have more logic holes than the average conversation with a three year old." These stories are full of improbable incongruities that have nothing to do with pumpkin coaches or fairy godmothers. And so there is something inescapably fun about unpacking motivations that could drive our beloved characters into their bizarre situations. There is something incredibly satisfying about rearranging background events and people to account for the supremely unlikely Ever After that the story demands. And, at heart, there is something simply wonderful about telling a familiar story in a new and exciting way. 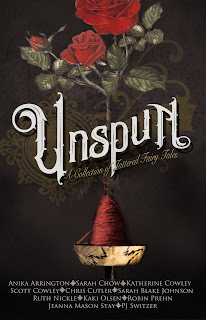 The short story anthology Unspun comes out April 10, and includes my story Heart of a Thief, in which I get to do exactly this sort of unpacking and rearranging to Jack and the Beanstalk. You remember the story: Jack goes to sell the family cow and ends up trading her for magic beans. This seems like an awful bargain, but those beans turn out to be the real deal. Jack bravely acquires gold coins, a magic harp, and a goose that lays golden eggs. Oh, and the giant who owned them dies when Jack chops down the beanstalk. For the shocking low price of one cow (and possibly being charged with manslaughter, depending on the legal status of giants in this setting), Jack gets fame and fortune. You can see the obvious problem. Why on earth would someone who has magic beans trade them for an old cow? That person ought to use the beans to go get the treasure themselves. What could possibly motivate the kind old man to part with his miraculous legumes? The man is Jack's estranged father in disguise, coming back to make amends by giving Jack something valuable. It's the giant's wife in disguise, hoping to get rid of her good-for-nothing husband. That explains why she keeps hiding Jack in the house on repeated visits despite Jack's habit of running off with their stuff. Buying the cow is step one of a heist. It's easier to rob a farmhouse than a giant's stronghold, and he's planning to steal the treasure from Jack. He stole the beans from a passing wizard, not knowing how valuable they are. Now he's being pursued and needs to offload them quick. The cow is magic! Forget golden eggs, this cow's milk is like the fountain of youth! In the end I settled on something else, and had a great time writing my way through the old man's story. Designing the world and magic was fun, and telling the story was satisfying, but figuring out the man's motivation for buying Jack's cow was my favorite part. For more information about Unspun, see my post announcing the anthology. For my take on another fairy tale, check out my analysis of Goldilocks and the Three Bears. Are you looking for more fairy tale retellings? My two favorite adaptations are Gail Carson Levine's Ella Enchanted and Shannon Hale's Book of a Thousand Days. I am also currently enjoying the webcomic Namesake. More authors of great retellings include Robin McKinley, Patricia Wrede, Juliet Marillier, and Jessica Day George. Unspun: Announcing a book release! I'm thrilled to announce that a short story of mine called "Heart of a Thief" will be published in an anthology set to release on April 10. I will post a link as soon as the book is available. I am very fond of fairy tale adaptations, so when I was invited to submit one of my own, I jumped at the chance. The theme of Unspun can be summed up as "After the Ever After," and all of the stories explore what takes place beyond the traditional ending of a given tale. My own story, which I'll talk about in a separate post, takes place after the events of Jack and the Beanstalk. I am pleased with how it turned out, and even more pleased with stories it sits beside in the collection. Tatterhood and the Prince's Hand, by Katherine Cowley Based on Tatterhood, this novella is the centerpiece of Unspun, and is a truly standout exploration of acceptance and personal strength. Cowley's excellent storytelling showcases her wonderful characters and interesting magic. Breadcrumbs by Jeanna Mason Stay Based on Hansel and Gretel, this beautifully written story is an intimate look at someone struggling to deal with past trauma. Stay's prose is superb and her characterization of Gretel is supremely empathetic. Ethical Will by Kaki Olsen Based on The Nutcracker, Olsen's story is emotionally authentic and begs for a sequel of its own. I love how the events of the plot intersect with the main character's stages of grief as she mourns her mother's recent death. Disclaimer: I recognize that there are important societal issues to consider when discussing overpopulation. This is a math/science post, so I'm planning to completely ignore those. "Humans are overcrowding the planet!" is a concern that crops up at least once a generation. Up until now, I have had little patience with the doomsayers. The idea that a family's children after the first (or second or third) are a burden that the world cannot accept is disturbing and offensive to me. Yes, there are problems that come with larger populations, but I generally choose to trust in our ability to solve those problems. For example, people have been predicting that we will run out of food at least since the industrial revolution. But the the Haber process (invented ~1910) let us create fertilizer, and was just one in a string of many important innovations that have allowed us to support more and more people. Over and over we have surpassed the supposed "upper limit" of sustainable number of humans, and in the process discovered amazing new things. Science!. Moreover, I trust in the nature of large systems to be self correcting (i.e. parents can figure out whether they can support another child without me or an economist telling them, and those local decisions will be based on global resource allocation). BUT! This video from Numberphile has convinced me that there is an inescapable upper bound, and that it is approaching far faster than I would have guessed. They calcualted the number of particles in the human body (~10^29), and in the observable universe (~10^80). So if there is nothing in the universe but people, we could make 10^51 of us. I think it goes without saying that that is a LOT of people. So, no problem, right? This abstract idea is absurdly impossible, yes? NO! If you assume that the world population (now ~7 billion) continues to grow at it's current rate (a little over 1% per year), we have less than 9000 years before we run out of universe! And even though the video doesn't say this, that 9000 year cut-off applies even if we use not just the normal matter, but also the other 95% of the universe made up of dark matter and dark energy. Clearly, something will have to give before that point, and I'm not willing to bet that thing will be the universe. Presumably there are some other obstacles in the way before we reach that point, but I think we can agree that we have established an absolute maximum, beyond which even the most optimistic would not try to push us. Wikipedia just taught me that the first discussion of gravitational waves (detected last year by LIGO - yay!) was by a scientist named Oliver Heaviside. Another instance of perfect naming. Good article on LIGO here. Sierpinski's triangle (below) arises from various apparently unrelated things beyond the obvious stepwise removal of smaller triangles. You can find it from chaotic attraction, from the parity of Pascal's triangle, or from turning a line into a trapezoid iteratively. I only knew about the last one, and was surprised to learn that it shows up in other places this way. One of my favorite scientific realizations is the idea that all of the trees and plants we see are basically solidified air. Photosynthesis is the process of using energy from light to turn air (carbon dioxide) and water into sugar, and that sugar is then used both as fuel and as a structural building block to make more plant. I've wondered how much photosynthesis actually happens on earth, and recently looked up the answer. Current best estimate: 150-175 petagrams per year, or about 0.45 petagrams per day. A petagram is the same thing as a gigaton, but how much is that really? The most useful comparison I found is that the mass of all living humans is 0.5 petagrams. So every day, plants and algae make enough sugar to rival the combined weight of humanity! Another way to look at it is that a cup of sugar weighs 200 grams. So 0.45 petagrams of sugar is enough to fill up Sydney harbor, or make a sugar cube half a mile on each edge. Such comparisons aren't entirely fair, because all that sugar isn't just piling up into cubes. Plants use up about half of it as energy. And while the other half gets incorporated into new plant growth, plants are being eaten and converted back into energy just as fast. So really what we are measuring is the daily calorie intake of the planet, which is estimated at ~1% of the sunlight that reaches earth's surface. 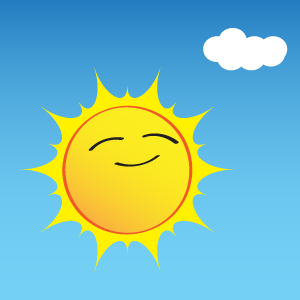 Hooray for photosynthesis! Kelley and I were talking about space last night, partly because the Cassini probe completed a dive between Saturn and its rings, and partly because Jace has been been learning about planets. We watched this excellent video, which starts out comparing the sizes of various planets and stars, then zooms out to compare the scale of galaxies and more. Such mind-boggling vastness can make one feel very small, so naturally we tried to counter that by thinking of the tiniest things in the universe. 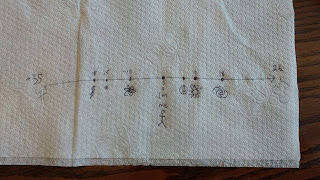 Here is the chart we came up with. Unfortunately, I got some things wrong, so please refer instead to the revised chart below it. Here we have the revision with text labels and more accurate spacing. The axis is a log scale, so each step of 3 brings you to something a thousand times bigger or smaller. It takes approximately the same step in size (~9 orders of magnitude=a billion* times bigger in diameter) to get from an electron to an atom, from an atom to us, and from us to the sun. Two more of those steps take you from sun to observable universe, but the galaxy is well past the first of those. 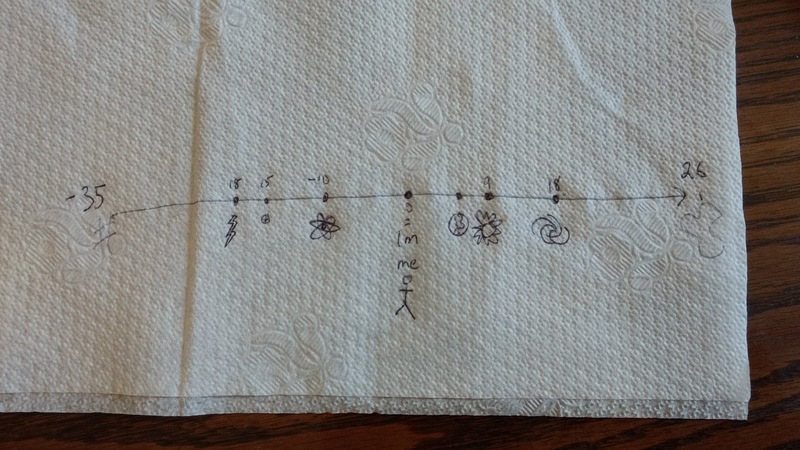 (This was the main error in my napkin version--the galaxy is approximately one billion solar systems across, not one billion suns.) Note: That is linear distance; our galaxy contains 100 billion stars. Two big steps in the other direction take you from an electron down to the Planck length (below which "distance" ceases to mean anything). Once you contemplate the vastness of something a billion-billion-billion** times bigger than you, it is not helpful to say "Well, yes, but that's just the observable universe. The whole thing could not only be far vaster, it could truly be infinite." For a great illustration of the bigger-than-us half of the chart, check out this xkcd image. If you want to look at an interactive zoomable chart with a lot more objects than mine, this is a good one. *I use the American billion here. If you are feeling European today, feel free to translate to milliard. **Octillion for Americans, or quadrilliard for the traditionalists. This is the second in a series of posts recommending useful resources in various areas. These are apps or tools I use regularly. Today's topic is: Books and Entertainment. All apps are for Android, and links will take you to the Google Play store. Overdrive (website and app) is the standard portal for borrowing digital content from public libraries. I have checked out tons of ebooks this way. Reading them in the Overdrive app works fine, but when possible I get my books in kindle format, as I prefer the reading experience and features of the kindle app. I've also enjoyed many audiobooks from my library via Overdrive. Hoopla (website and app) is another library content portal, with a different licensing system. If your library subscribes, this would be well worth trying out. Their book selection is much more limited, but most items are recent releases or other titles that Overdrive doesn't have. In addition, Hoopla has a broad selection of music, TV shows, and graphic novels. (It's how I listened to the Hamilton soundtrack and watched The Librarians). In contrast to Overdrive's model, in which a library buys a certain number of copies to lend (which results in waitlists for popular titles, and different collections available from different libraries), Hoopla's content is always available, with a limit on the number of items a patron can check out each month. So if Hoopla stocks something you want, you can get it right away! My only complaint is that Hoopla's app does not deal well with orientation changes of your device. If you turn your phone, it will spend time loading the book again and probably lose your location. Make sure you lock your phone display into portrait if you plan to read something in the app. Goodreads is the best book tracking website I've seen. I love it: for logging and reviewing books I've read, for finding and keeping track of books I want to read, and for seeing what my friends recommend. In most respects I find the app inferior to the web version, but it does have the incredibly convenient feature of adding books by scanning them. This used to be ISBN barcode-only, but a recent update added the ability to identify books from the cover. Strangely, that messed up the reliability of ISBN-scanning, but the cover-scanning feature works so well that I usually don't miss it. Adding a dozen library books at a time is fast and simple, which is great since I try to keep up with all of the picture books we check out. Letterboxd aspires to be Goodreads for movies. (At least, that's how I use it. I'm sure the creators have a somewhat different vision for their product, to judge from the number of features I don't use.) I use it to log and rate movies I see, but that's about it. I tried several similar websites, and this was the best one for my purposes.